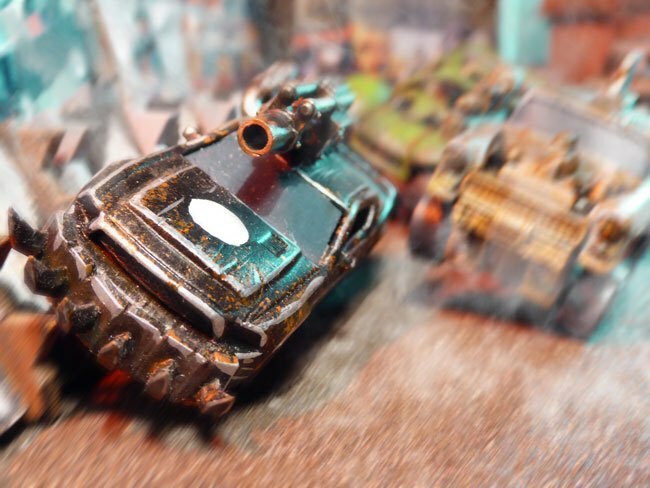 In todays Interview, we are happy to welcome here Mr. Mike Hutchinson, author of highly successful game of vehicular mayhem published by Osprey Games in their Wargames series – Gaslands. Recently, the game has been awarded as the Best Miniature Rules at UK Games Expo by judge‘s choice AND people’s choice. First of all, thank you for agreeing to answer our questions and welcome to our blog. MH: Thank you for having me! Can you tell us something about your gaming history? MH: Sure. I started gaming with a box of HeroQuest when I was 11 or so, and played a lot of Games Workshop games during the nineties. My dad had always been a board game fan, and so my brothers and I grew up with quite a collection. In fact, my first wargame was probably The Battle Of Little Bighorn, now I think about it! Why have you decided to write game of post-apocalyptic, vehicular-mayhem reality show? MH: I write a lot of games. I try to write a new game every month. Most of them are terrible, but occasionally something isn’t. I had been playing a ton of X-Wing with my friend John and he suggested that the world was short a really good car combat game. I hadn’t got a better idea for a game that month and so tossed something off, just four pages. I didn’t work on it anymore at the time, because Warhammer was going through it’s big change into Age Of Sigmar and I had a fantasy battle ruleset called “Hobgoblin” that I thought was really good and was trying to sell to someone. Osprey were one of the many people who turned Hobgoblin down, but then got back to me about the little car combat game on my website. Phil, the manager of the games line at Osprey, liked the look of the rules system and immediately saw the potential of a game that used Hot Wheels cars. Gaslands was off the starting line! Why a reality TV show? I wanted an angle to the game’s setting that allowed me to put in less “realistic” rules, and make it more like video game logic than real-world logic. I like games that amp things up to cinematic, cartoony levels. I hope Gaslands does that. Also, I just really love The Running Man movie! Out of curiosity…do you drive a car? 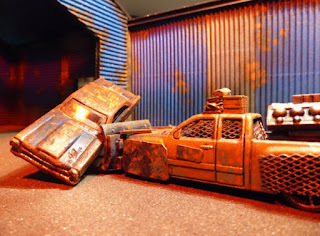 Gaslands Facebook Group grows every day and reached more than 7 thousand members. You have invented system for third party producers of templates and dice called Friends of Gaslands. The rulebooks have been sold out in most channels (Amazon, Osprey etc.) within weeks. Best miniature games award at UK Games Expo. Did you expect such a success? MH: No. Of course not. This is my first published game, and I had to do all the community building myself. I hoped it would stand out as unique in the Osprey Wargame Series, which is itself quite popular, but I couldn’t have hoped for the reaction so far. I think that the growth of the game has a lot to do with the price point and the low barrier for non-miniature gamers. It’s cheap to buy toy cars (and you probably have some already maybe), and they don’t require any complex or expert assembly. With a game that easy and cheap to try once, it’s a low risk proposition. Then once people play the game and find out how silly and fun it is, that they are hooked and want to tell others, who will probably give it a go once, see as how easy and cheap it is to get involved! What do you plan to do next with Gaslands? Will you somehow extend the world of Gaslands maybe with miniature games, role-playing games? 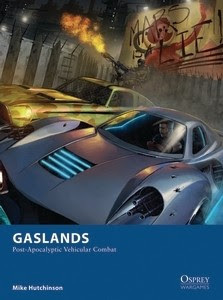 MH: The main focus for Gaslands at the moment is the series of free, downloadable expansions called Gaslands: Time Extended! These are coming out roughly every two months, to provide new ways to play the game and new options for building vehicles and teams. Beyond that… nothing I can talk about yet! You are now working on another project for Osprey Wargames called A Billion Suns. What can you tell us about this game? MH: A Billion Suns is a tabletops wargame about being the admiral of a huge fleet of spaceships, and trying to make the most of that colossal interstellar armada even with the difficulties of time-delayed communication across vast distances. It’s going to be another Osprey “blue book” and it’s going to support any miniatures in any scale on any bases. What is your inspiration for A Billion Suns? MH: Ender’s Game. Star Trek: TNG. Star Wars. Battlestar Gallactica. Anything that focuses in on the commanders in huge space battles. The game also brings in inspirations for real-time strategy computer games, as you’ll see from the way units of ships are ordered about the battlefield. What size of the fleet will be needed for the player to have? One of my design principles is that the game must be extremely scalable. We have been playtesting between 4 and 16 ships per side so far, but I’m aiming to support 30 ships before the core system design is finished. When designing a game, what is your general philosophy? MH: Writing is re-writing. My games don’t start good. I have to rewrite them again and again before they are worth playing. In order to keep me focused, I’ll always start with some design principles for the game, but other than those: nothing is sacred. Just because something has been in the rules since the first draft, that doesn’t guarantee that rule is somehow core to the game. If anything, it just increases the likelihood that that rule could probably be better. According to you, why should players choose to buy your game in the tough competition in gaming nowadays? MH: Gaslands is not really like anything else on your shelf. It’s a miniatures game that doesn’t really need miniatures. It’s crazy cheap. It’s stuffed full of hobby opportunity. It’s a highly sociable wargame that supports up to 8 players. If you race, it’s not a game soley about blowing up the other guys (although it still is about that). It’s a really fun game, with a carefully blended combination of meaningful choices and random, but memorable, nonsense. Try it and you’ll see. And we did, you can see our review of Gaslands here.